Congratulations to the winning team – THE SPELLBINDERS (Barbara Grae, Dorothy Greene & Rose Silvestro) – returning champions who won this year’s competition by correctly spelling ‘aberrant’. 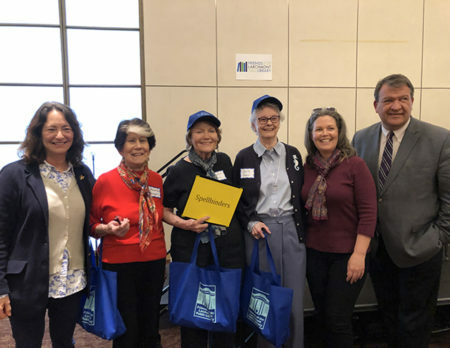 The winners are pictured here with Nancy Seligson (Mamaroneck Town Supervisor), Lorraine Walsh (Mayor, Village of Larchmont), and George Latimer (Westchester County Executive). Thanks to everyone who participated, came as a spectator, and special thanks to the Friends of the Larchmont Public Library for making the BEE possible. BBC Is Now on HOOPLA!